Like animals, plants possess an immune system to fight off invading parasites. Unlike vertebrates that possess both adaptive immunity and innate immunity, plants solely rely on innate immunity, which deploys immune receptors to detect molecules derived from parasites and activate defenses. Plant innate immune receptors are encoded by disease resistance genes and include surface-localized receptors and cytoplasmic nucleotide binding leucine-rich receptors (NLRs). The latter also exist in animals. Upon perception of microbial molecules, some animal NLRs are known to form oligomeric inflamasomes that recruit caspases to trigger cell death. It remains unknown, however, whether plant NLRs also form oligomers and, if so, how an oligomeric plant triggers defenses. It has been 25 years since the isolation of the first plant disease resistance genes, but our understanding of plant NLR proteins remains inadequate, largely because of a lack of a structure for full-length plant NLR. In a recent study, a team led by scientists at Tsinghua University (TU) and the Institute of Genetics and Developmental Biology (IGDB) of the Chinese Academy of Sciences (CAS) solved the first structures of a full-length plant NLR protein and uncovered previously unknown mechanisms of this important class of immune receptors. The IGDB team previously found that the bacterial pathogen Xanthomonas campestris pv. campestris deliberately secretes into plant cells a virulence protein called AvrAC, an uridylyltransferase, to subvert immune signaling downstream of cell-surface immune receptors. They later found that Arabidopsis plants employ an NLR protein called ZAR1, an adaptor protein RKS1, and a decoy protein PBL2 to accurately sense the virulence activity of AvrAC. As such, PBL2, RKS1 and the cytoplasmic NLR receptor ZAR1 act together as a trap to monitor bacterial activity and trigger disease resistance. In the current study, the joint team applied cryo-EM to first solve two structures of ZAR1 protein complexes, a resting state ADP-bound ZAR1-RKS1 binary complex and a ZAR1-RKS1-PBL2UMP tertiary complex. This allowed mapping of critical structural features required to keep an NLR at a resting state prior to pathogen perturbation, including ADP-binding and intramolecular interactions among different domains of ZAR1. The researchers further found that the in vitro assembled ZAR1-RKS1-PBL2UMP tertiary complex exists at an intermediate/primed state, in which the binding of PBL2UMP to RKS1 triggers steric clash between an RKS1 segment and the nucleotide binding domain (NBD) of ZAR1, leading to depletion of ADP from ZAR1. 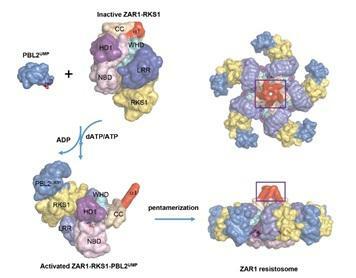 They further showed that upon addition of ATP or dATP, the ZAR1-RKS1-PBL2UMP tertiary complex forms a pentameric structure called resistosome, demonstrating for the first time that a plant NLR also oligomerizes upon activation. The cryo-EM structure of resistosome and further biochemical and functional analyses demonstrated that the formation of resistosome is essential for disease resistance and hypersensitive cell death-triggering conferred by ZAR1. While the ZAR1 resistosome resembles animal inflamasomes in various ways, the study showed that the ZAR1 protein possesses an N terminal α helix that acts as a “death switch” by specifically flips up in the activated resistosome to form a pore at the plasma membrane. This triggers cell death and activation of disease resistance. NLRs are the largest family of plant immune receptors, and each plant species hosts up to several hundred NLRs that confer resistance to a wide range of parasites, including phytopathogenc viruses, bacteria, fungi, oomycetes, nematodes, insects and parasitic weeds. The findings of this study shed light on the disease/pest resistance mechanisms in numerous plant-parasite systems. This knowledge opens up new possibilities for controlling disease/pest damage to crop plants. The study was published as two back-to-back research articles in Science on April 5, 2019. The work was supported by the Strategic Priority Research Program of CAS and the National Natural Science Foundation of China.